What is hemophagocytic lymphohistiocytos is? This condition, which is usually triggered by respiratory or gastrointestinal viral infections, is associated to uncontr Olled expansion of cytotoxic T lymphocytes which results in macrophage activation. Hemophagocytic syndrome has been observed in multiple genetic diseases that are characterized by severe impairment of Natural Killer and CD8 cytotoxic activities, suggesting a primary role of these cells in the regulation of lymphocyte homeostasis. 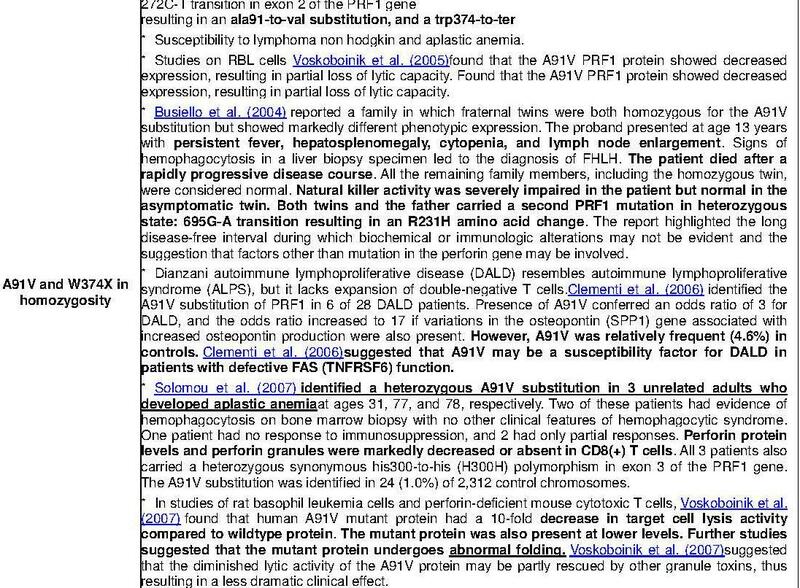 Familial hemophacytic lymphohistiocytosis is usually associated to mutations affecting genes encoding for proteins which are required for cytotoxic activity of NK and CD8 cells in particular perforin (PRF1). But in a significant portion of patients, the genetic cause remains undefined, suggesting genetic heterogeneity, despite the homogenous clinical manifestations of the disease. S. PAROLINI, R. BADOLATO, “La sindrome emofagocitica:dai sintomi alle cause genetiche”, PROSPETTIVE IN PEDIATRIA 2006; 36: 45-52. 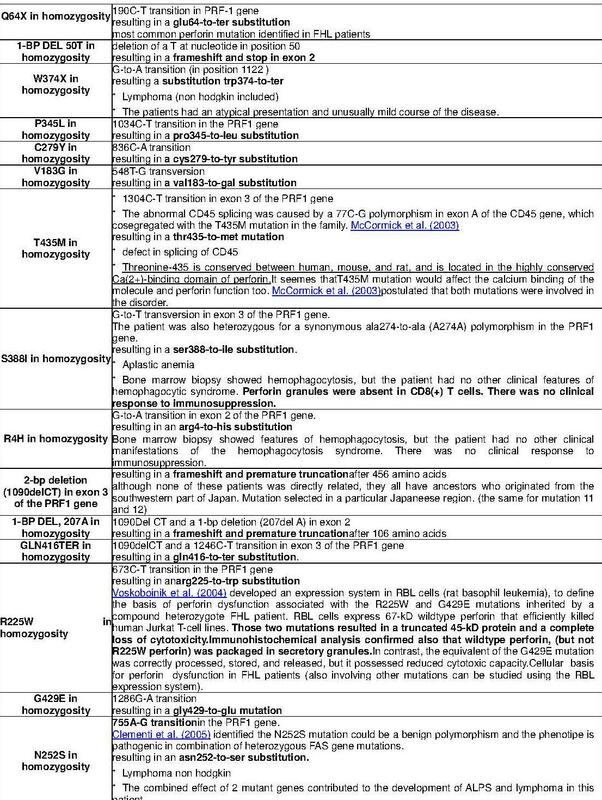 Why studying hemophagocytic lymphohistiocytosis is an important tool to demostrate perforin role and cytotoxic meccanisms? As we know, during a viral infection, is important the coordinate activity of B cells, NK, macrophage, CD8 cells and DC cells. In particular NK and CTL are the the most important cell population for anti-viral mecanisms and anti-tumoral mechanisms, and they use perforin for their activity S. PAROLINI, R. BADOLATO, “La sindrome emofagocitica:dai sintomi alle cause genetiche”, PROSPETTIVE IN PEDIATRIA 2006; 36: 45-52. So FHL should be a model to study every process in cytotoxicity that involve directly or indirectly perforin. Perforin is one of the most important component of immune system involved in Immune surveillance. Escape from immune surveillance is thought to be the main mechanism possibly explaining the role of some predisposing genetic mutations in the development of leukemia and lymphoma Bolitho P. et al. Perforinmediated suppression of B-cell lymphoma. 2009 106:2723-2728 Proc Natl Acad Sci. The key role of perforin in immune surveillance has been extensively investigated using perforin knockout (PRF1-KO) mice, which show high sensitivity to several viral infections. These PRF1-KO mice develop spontaneous and aggressive disseminated B-cell lymphoma, and fail to efficiently reject many transplanted tumors R.D. Schreiber “Cancer immunoediting deciphering the complex interaction between immunity and developing tumors”. The same can be described in Humans, using this desease. 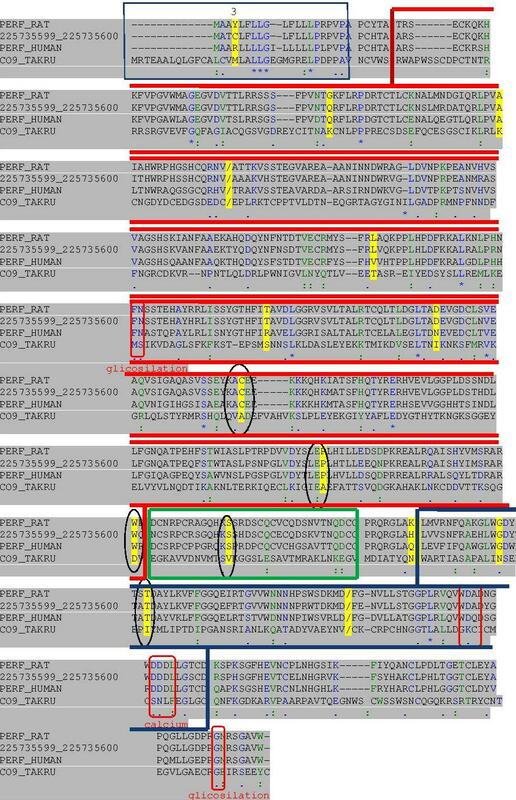 These PFR-1 mutations include non sense, frameshift and missense mutations disrupting perforin activity Patients with FHL caused by biallelic perforin mutations are severely immunocompromised El Abed et al. Hereditary Cancer in Clinical Practice 2011, 9:9, so they result usually nonsense mutations in the heterozygosis, frameshift and missense mutations, and it depends on the amino acid change, we have different effects more or less serious. In some cases there is a decreased expression, while in others cases the protein is expressed but it doesn’t work: it depends on the domain or on a change in amino acid interactions. 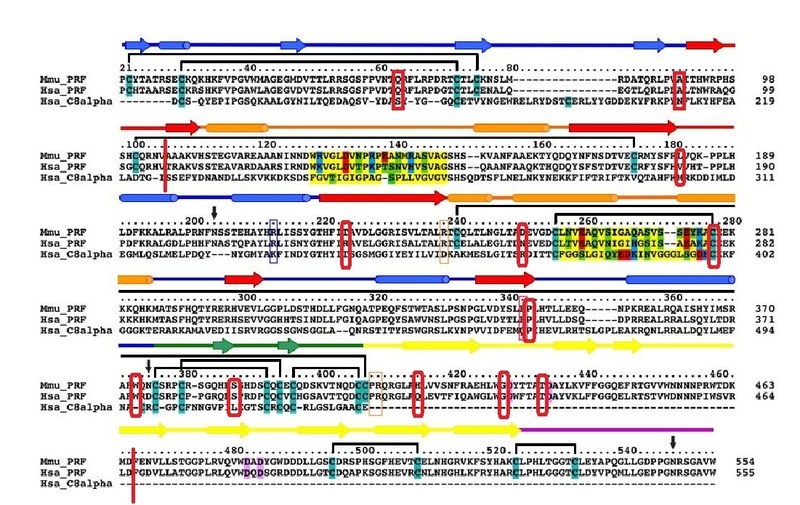 Here we can see mutations annotated in omim. Majority of these identified mutations compromise completely or partially the expression of this protein. They lead to a failure in citotoxic activity of T linfocite (CTL) and NK cells. S. PAROLINI, R. BADOLATO, “La sindrome emofagocitica:dai sintomi alle cause genetiche”, PROSPETTIVE IN PEDIATRIA 2006; 36: 45-52. Then it would be evidenced omologus reagions belong different species: perforin is an high conserved protein. Those mutations are sometimes conservated belong species, and in those cases are important amminoacid mutations (important for Perforin function). Because of that, in the following figure it was highlight allelic variant mutations on amino acid sequence comparing Human, mouse, rat and Japanese pufferfish sequence. It’s clear that most of those mutations affects conserved amino acids in conserved reagion, focusing that those affect important regions. Majority of mutations affect MACPF domain and EGFR like domain. No one of those mutations involve a calcium binding site or a glycosilation binding site. Structure conservation among species, gives an idea of important domains and important sites. 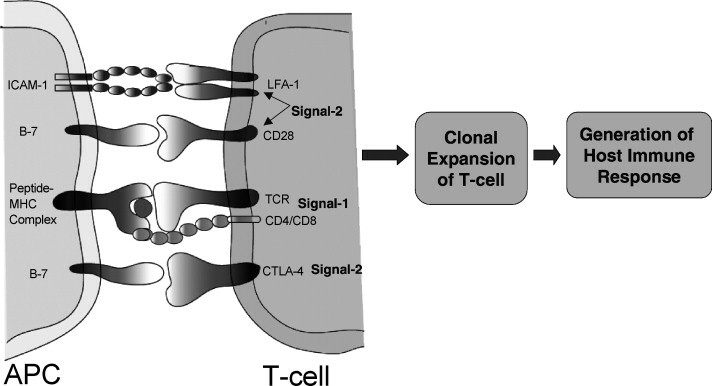 T cells activation and maturation of T linfocite is a clonal antigen dependent process. 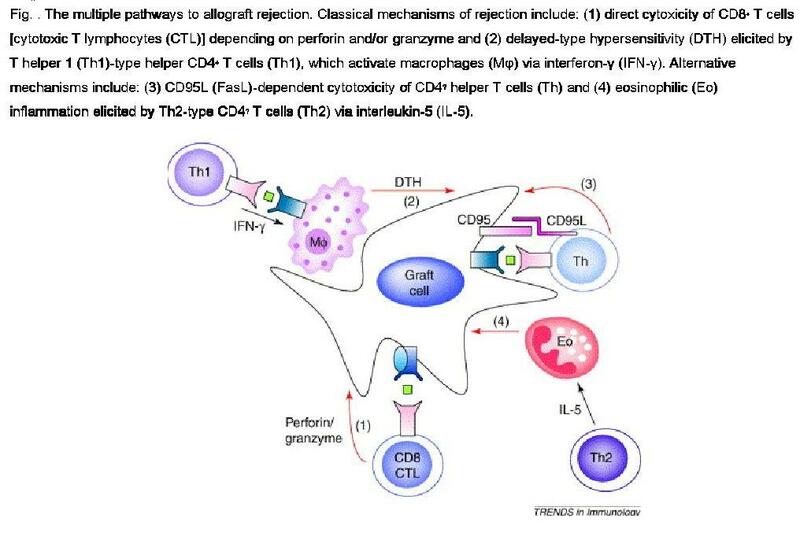 The interaction of TCR with non self antigens leads to the activation of pathways of maturation and proliferation with an high production of INFγ, important in the control of viral (and tumoral) replication, in macrophage activation, and in inflammatory response (producing IL-1, IL-6 and TNF). When CTL matchs a MHC 1 presenting a non self peptide, the first reaction is the exocitosis of perforin and granules, to kill the infected cells. Infact the problem in Hemophagocitic syndrome is that, in consequence of the reduced cytotoxic activity of these cells, there is a decreased ability to remove the infection and then the persistence of a state of activation of T lymphocytes . In these conditions, the activated T lymphocytes release large amounts of cytokines, as IFNγ and GM-CSF, which in turn to stimulate macrophages. The excessive activation of macrophages leads to classical symptoms. Effector pathways and T-cell homeostasis after infection. In situations of pathogen challenge, antigen-specific T-cell homeostasis also seems to be regulated by perforin, although the details of this process are unclear. Natural killer (NK) cells are specialized innate lymphocytes capable of responding to virus-infected and tumor cells. Unlike cytotoxic T lymphocytes (CTL), NK cells do not require antigen-specific recognition to kill target cells, and as such are capable of limiting viral infection prior to the induction of adaptive immune responses. Compelling evidence for a critical role for NK cells in limiting viral infection has been provided by studies with herpesviruses, such as cytomegalovirus (CMV), herpes simplex virus (HSV) and Epstein-Barr virus (EBV), as well as HIV. 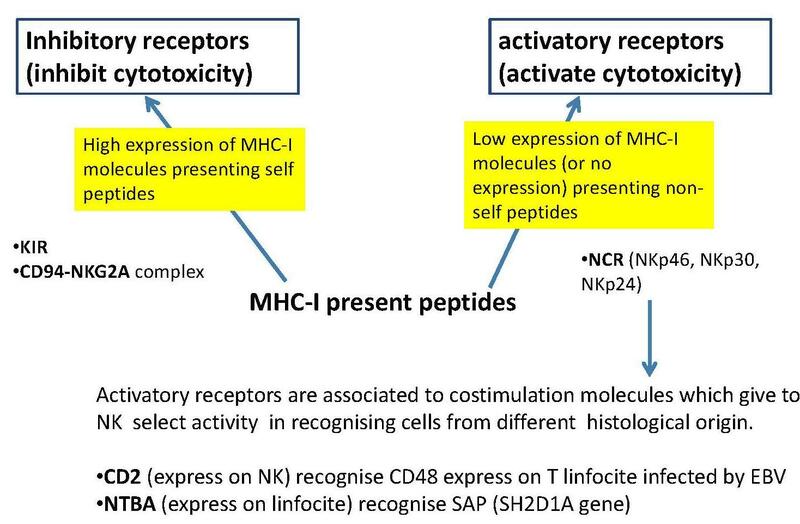 NK cells also exhibit spontaneous cytotoxicity against major histocompatibility complex (MHC) class I-deficient target cells, and in particular they participate in the innate immune responses against transformed cells and tumor metastases in vivo. The effector functions of NK cells include cytotoxicity and the ability to produce a variety of cytokines (including IFN-γ) following activation, but granule exocitosis is the most important one . * NKG2D (MHC class I-related molecules of host receptors), The lectin-like NKG2D receptor is expressed on NK cells, γδ+ T cells, CD8+ αβ T cells and activated macrophages. NKG2D is engaged by ligands that are structurally related to MHC class I molecules. * Ly-49H (MHC class I-related molecules of pathogen origin or m157). Each NK cell may express several primary activating receptors (es. 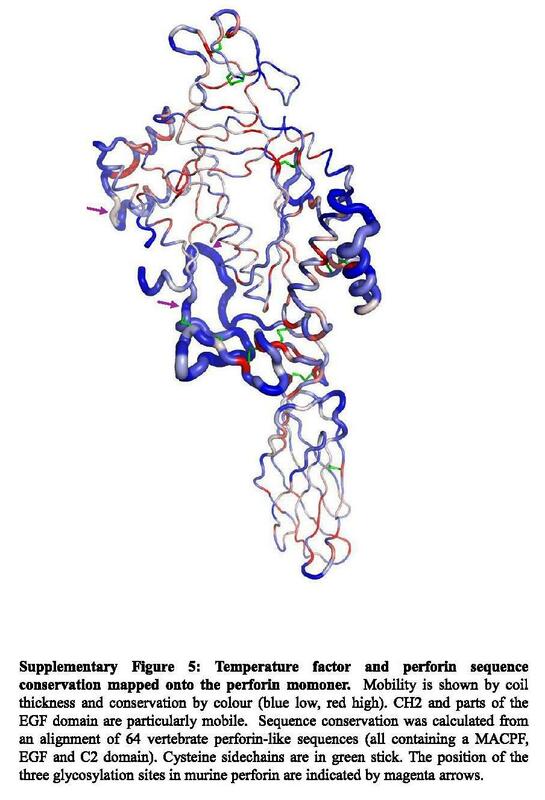 NKG2D) and potentially in addition, an abundance of co-stimulatory receptors (e.g. CD28/ICOS, CD27, CD154). Signals integrated from these activating receptors and inhibitory receptors determine NK cell responsiveness. Specific activating receptors appear to trigger either cytotoxicity and/or cytokine production. NK cells mediate cell killing though a variety of mechanisms, including perforin/granzyme granule-mediated exocytosis or signaling through the TNF death receptor family members. IFN-γ, secreted by NK cells, plays a critical role in suppressing pathogen challenge, both to contain the initial infection, and to promote an appropriate adaptive response that may take several days to mature. In figure we can see TRIAL and FAS ligand, they are both expressed on the NK cell lines (via IFN-γ) and they mediate death pathway in the target cell. In particular TRAIL was shown to be involved in the cytotoxic activity of activated NK cells against TRAIL-sensitive tumor cells in vitro. TRIAL is highly expressed on NK cells, after stimulation with IL-2, IFNs, or IL-15. These expression patterns reflect the broad role that TRAIL likely plays in innate immune responses involving IFNs (by IFN-γ, as well as IFN-αβ) and NK cells. Death-receptor-mediated killing has been assessed in humans and mice with mutations in FasL (gld mice) or Fas (lpr mice), and in mice deficient in tumour-necrosis factor (TNF)-related apoptosis-inducing ligand (TRAIL). Some patients with hemophagocytic syndrome do not have mutations of PRF1 or abnormalities in the expression of perforin, despite the examination shows a reduced cytotoxic activity of NK cells. 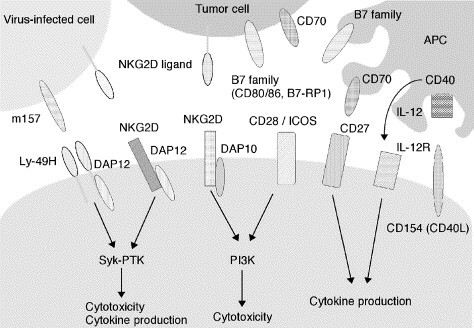 Non perforin mutation highlight perforin and cytotoxicity pathway in NK and CTL. MUNC-13-4 Not only perforin is important, infact among these patients have been identified the mutations of UNC13D, gene coding for the cytoplasmic protein Munc 13-4, which is necessary to induce exocytosis of granules cytotoxic. In this condition (FHL3) cytotoxic cells of the patients have a reduced functional activity, although their content of perforin is normal. Furthermore, these cells are able to form the granules cytotoxic, to guide them towards the membrane of exocytosis, and to form conjugates with target cells, but those cells can’t complete the process of exocytosis due to the lack of the protein Munc 13-4 which is necessary for the fusion of the granules with the plasma membrane. STX11 Others non perforin mutations affect STX11 a gene codifying for sintaxin-11. This protein is expressed in the cytoplasmic compartment intermediate between the trans-Golgi network and endocytic compartments, and therefore could be involved in the formation of cytotoxic granules rather than in the process of exocytosis. RAB27A An other one mutation involve the gene RAB27A, a gene coding for a protein with a GTPase activity, that regulates the transport of the granules through the secretory pathway and / or the endocytic pathway. In fact, genetic defects of RAB27A prevent the secretion of cytotoxic granules and the interaction of Rab27 with Munc 13 totally prevent exocytosis. CHS1 patients with genetic defect of CHS1 involves the failure of the cytoplasmic protein synthesis CHS1/Lyst. The specific role of this protein is unknown, but is supposed to be involved in intracytoplasmic vacuolar traffic mechanisms and probably is expressed in Golgi. In this condition, therefore, it is also compromised granules formation, in which should be assembled mature lytic enzymes before exocytosis. 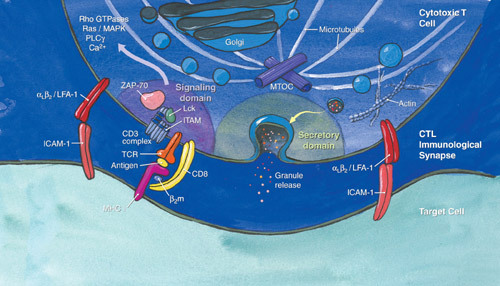 The activation of cytotoxic cell, induce to form an immunological synapse, by using integrins molecules (this close association between T cell and target is known as the immunological synapse). Leukocyte function antigen 1 (LFA-1) is essential for the formation of immune cell synapse, it binds ICAM molecules, but comparing LFA-1 ligands, ICAM-2 and ICAM-3 promoted LFA-1–directed perforin release, whereas ICAM-1 had little effect. Ligand-induced LFA-1 clustering facilitated perforin release, demonstrating that LFA-1 could regulate degranulation mechanisms of the cytolytic granules containing both perforin and granzyme. 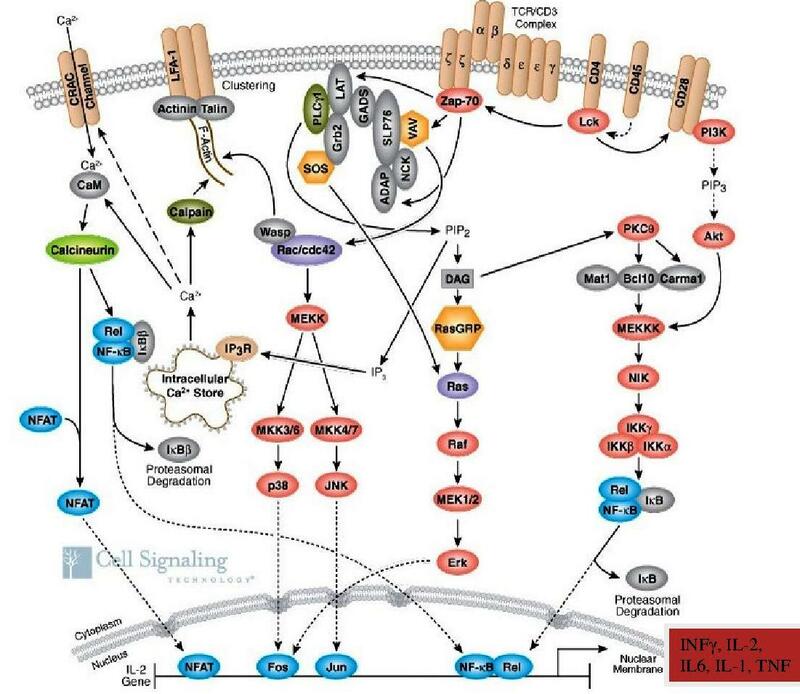 This mechanism is coupled also to LFA-1–mediated signaling mechanisms through src kinases, syk, Vav1, and p44/42 mitogen-activated protein kinase (MAPK), in human CD56+ NK cells. Upon TCR ligation, cytolytic granules move via polarized microtubules to the region of the MTOC where they dock prior to release. The mechanisms regulating the docking, fusion, and release process are not well understood. However, there is evidence to suggest important roles for the small GTPase Rab27A, and Munc13-4, a member of a family of proteins known for their roles in priming neuronal synaptic vesicles for fusion and release . The signalling pathways that regulate granule polarization and exocytosis are being determined; these pathways might be disrupted by the interaction of cancer cells with some cytotoxic lymphocytes. How does perforin induce cell death? Polyperforin pores induce osmotic instability and target-cell lysis (Fig. 1a). The antigenic similarity between perforin and complement component 9 (C9) reinforced this view. Polyperforin pores acted as passive conduits for granzymes to cross the cell membrane. The uptake of granzymes into cells does not require perforin and is mediated efficiently and rapidly by receptor-mediated endocytosis. But it perforin is important for granzyme activation. If granzymes enter target cells by endocytosis independently of perforin, target cell remains healthy and granzymes remain harmlessly sequestered in endocytic vesicles in absence of perforin. 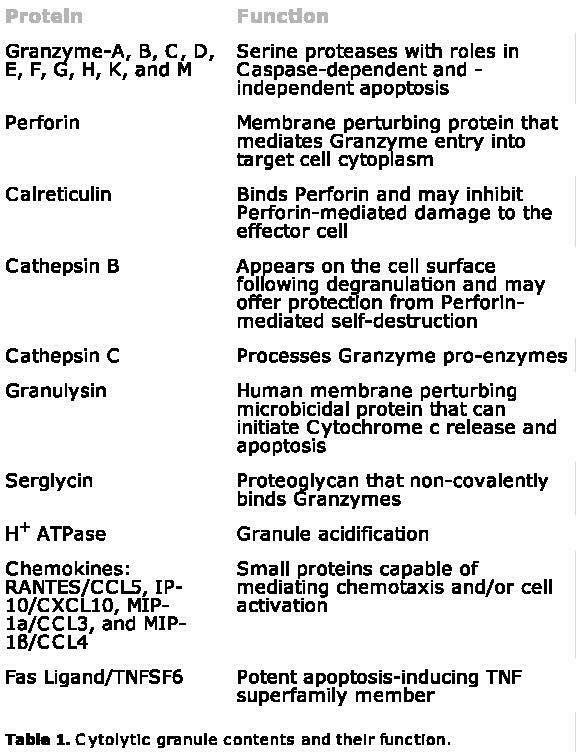 Providing small doses of perforin can synergize with granzymes A and B to induce rapid apoptosis, but perforin has not been shown yet to be present in target-cell endosomes or the target-cell cytoplasm. It recognizes the mannose 6-phosphate receptor (MPR) as a candidate cell-surface receptor for granzyme B. Granzymes and perforin both bind to the target-cell surface as part of a single macromolecular complex associated with serglycin further diminishes the probability of passive diffusion of granzymes. Rather, perforin has a role in disrupting endosomal trafficking after granzyme uptake into the target cell, but perforin doesn’t entry into the target-cell cytoplasm. * NK and cytotoxic pathway can be inhibited by viral proteins and endogenous intracellular serpins. 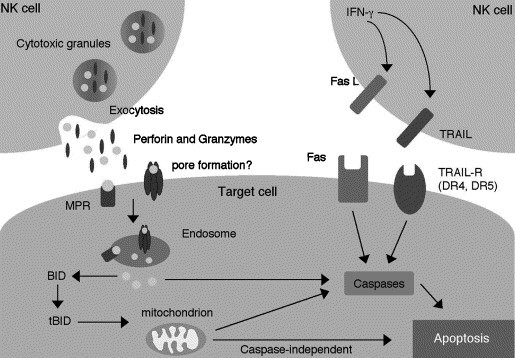 In particular granule-exocytosis pathways can be inhibited. Endogenous serpins such as PI9 that regulate the activity of granzymes in cytotoxic lymphocytes, in particular it seems to be overexpressed by tumours to block granzyme B. Various tumours express serpins, but there is no evidence so far that granzyme B is a key weapon of the immune system to eradicate tumours. * Serpins is also important in prolonging dendritic cells survival, making them more resistant to CTL-mediated apoptosis. * T linfocite granule-exocitosis is inhibited too: serpin inhibit the microtubule-organizing centre (MTOC), normally regulated by SYK/ZAP70 andPI3K, it is important to mobilie lytic granules towards the contacted target cell. The inhibition of PI3K in NK cells blocks downstream kinase activation and interferes with the movement of perforin and g ranzyme B towards target cells. By contrast, FASL-mediated killing is not dependent on the PI3K pathway. These data imply that tumours, viruses and, indeed, normal cells could potentially inhibit death pathways selectively, independent of TCR ligation.